with the 2019 Festival of Joy! 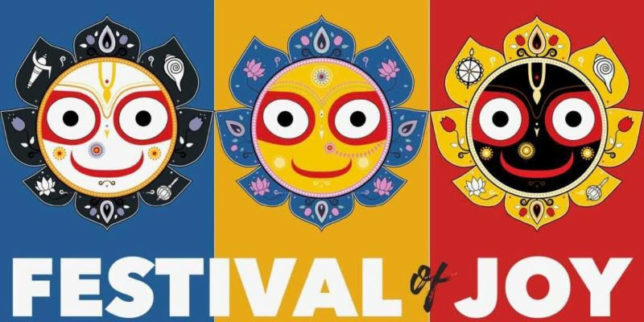 Experience India in Downtown Dallas at the 2nd Annual Festival of Joy, Presented by Kalachandji’s and the Crow Museum of Asian Art. Don’t miss the Parade Procession from 11:30 am -1:30 pm beginning and ending at Klyde Warren Park. The festival will continue in the park until 6 pm. The park’s main stage will feature non-stop classical music and dance performances with a variety of cultural and educational exhibits. Traditional crafts and cooking demos, yoga and meditation, face painting, henna and traditional dress-up in ethnic wear are just a few of the activities offered at the event. A free vegetarian feast, in addition Indian street foods are for sale as a total experience of India, right here in Downtown Dallas! Witness a cultural expression in motion as the parade marches from DMA to Klyde Park.